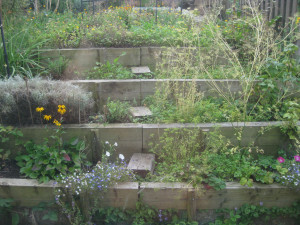 If you have a steep garden, terracing is a great way to make your garden more attractive and useful. Realistically, if your garden has too extreme a gradient, you’re not going to be able to run trains up them without serious problems. While you may have to make some compromises on your layout with a terraced garden, it’s better than the alternative of not doing it at all! As these things tend to be, it can sometimes seem an intimidating project to start, especially with no previous experience. It can be useful to browse the Internet for some inspiration and see what others have done with their gardens – especially if they’ve managed to incorporate a railway. As well as making your garden look more attractive, terracing stops rain water washing all of the soil and nutrients to the end of the garden, and allowing more than weeds to grow. Terracing can allow you to separate more than one railway line from eachother, perhaps with different plants in each area to add extra interest. Depending on your timescale and budget, there are a few different options for achieving this. 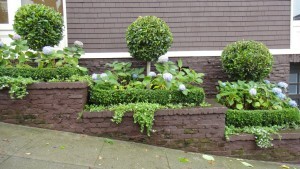 The more long term – though unfortunately tending to be the most expensive – is to use stone walls. You could also use wood, but you’ll be doing more ongoing maintenance. Make no mistake, this is a serious project in terms of time – and you’ll be amazed by how much earth needs to be dug up. It may be worth speaking to a professional landscape gardner – even if just for an initial consultation and assistance with planning things. Their fee may end up saving you time and money in the long term! Images by Lynn Friedman and Elanor Martin. Filed under How To, Layout Planning, Where To Start? Once you’ve built your line, you’re going to want to show it off! The best way to do this is to host an open day. Invite friends and family, or post up an invitation online – but I would advise you not to disclose your address until people have, at the very least, emailed to request it. This will keep out most unwanted visitors. On the day, people may wish to bring their own trains to experience having them run on your line, you should specify any restrictions in advance (for example if you do not wish to allow steam trains on safety grounds) so that people are not disappointed when they arrive. Draw up rules for safety (including such things as not crossing the line without looking, not driving the trains without permission etc). Even if you think these things are just common sense, putting them on paper can solve a lot of problems later. Ride on Railways has an excellent section dealing with safety. would fit onto a 4×6 sheet of plywood. amusement park, how many trains have you ever seen that just go around in circles? is’nt very successful on a model railroad. no room for two genuine terminals. The out-and-home layout solves part of this problem – it has only one terminal. This is really a point-to-point system doubled back on itself. train that is supposed to be traveling. problems except on very large layouts. procedure used by experienced model railroaders with plenty of space. 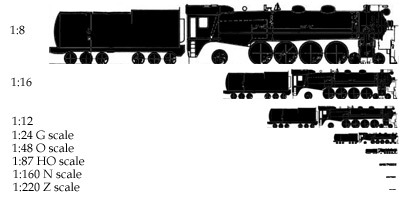 to the operation of your railroad. Please note: This post deals with model railways. A similar post for miniature railways (such as those you can ride on) will follow. These scales are generally considered far too small for garden railways. The track and scenery will be too small to really apreciate against the backdrop of your garden, and will be easily damaged. This should be an absolute minimum for a garden railway. It has the advantage of being very widespread – so track, trains and accessories are pretty cheap. However, I would recommend something a little bigger. I would recommend using one of these scales for your railway where possible. Their size means that your trains will be easily visible in all parts of the garden, and can make for some impressive detailing. These scales will be discussed further in a future post. One of the (potentially) most useful parts of this site will be a guide to how to build a garden railway. While this should not be considered a definitive guide by any stretch of the imagination, it should hopefully provide a good starting point for your own plans. Depending on how seriously you plan to take your new railway, planning can begin before you even purchase the house where the railway will be built. There are several things that you should be considering which will affect how you build your railway. This is not something that you can always gauge correctly simply by sight, but the gradient of the garden can have a large impact on how you build your railway – especially if you are planning to haul passengers. Smaller (O gauge or lower) railways will not be affected by this quite so much, as they can be built raised in sections, or earth can be moved easily to accomodate them. Look out for gardens that are as flat as possible – and try to get a picture of the finished line in your head, to visualise any potential problems with the construction – and how you could overcome them.